This exciting new poster is the first time the animal kingdom has ever been shown through the development of physical characteristics. It graphically demonstrates how the main branches of the new cladistic classification system were established. Animals differ from plants in that they have at least two cell layers; plants have only one. Metazoa is the biological name for the animal kingdom. It constitutes a �clade,� which is a group of organisms that share a common physical characteristic. In this case, it is more than one cell layer. The first significant physical development was the addition of a third cell layer. All animals have them, except the sponges and jellyfish. Thus each of these three groups becomes a clade. The poster continues through every major step of physical development. It illustrates and explains the new development and then shows representative species from resulting clades. 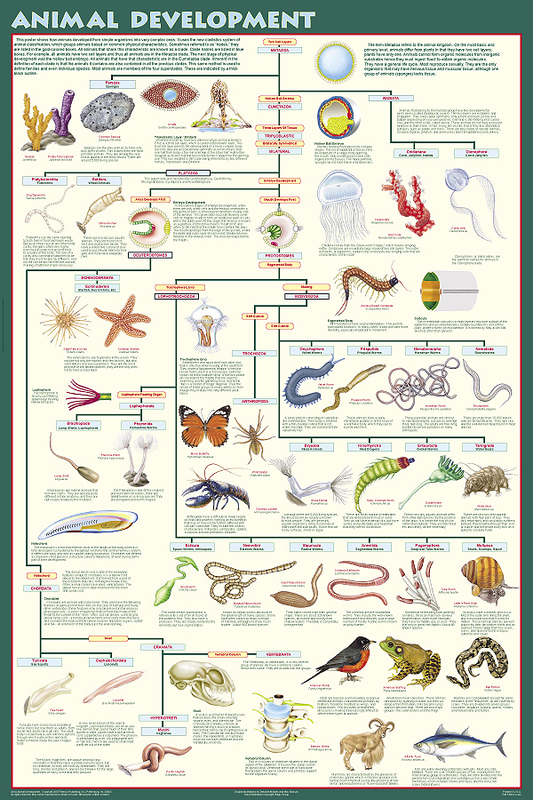 This poster is largely devoted to the invertebrates and is extremely helpful in showing how various groups are related to one another. It makes it easy to understand their common physical characteristics and their differences. The vertebrates are shown in lower right corner. The complexity of their development resulted in them being treated separately in Milestones of Vertebrate Evolution. This third cell layer permitted the development of a more complex body. Standard poster is large 24" x 36" size that fits standard frames. Printed on heavy, acid-free paper using non-fade inks, then coated to provide satin finish and provide protection from scratching. Laminated poster is completely encapsulated in heavy 3 mil plastic for long life.